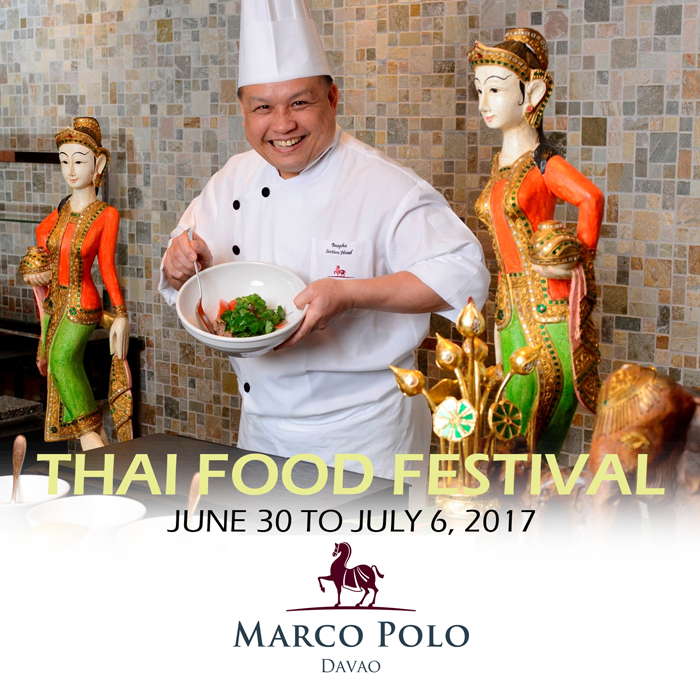 Marco Polo Davao brings another Southeast Asian flavor to Café Marco as they open the Thai Food Festival on June 30 with guest Chef Baupha from Hong Kong. The festival of flavors will run for one week until July 6 and will showcase some of Thailand’s signature dishes. Chef Nontra-Udon Baupha, a thai national, will be bringing with him 38 years of culinary experience in Thai cuisine. He is currently with the Marco Polo Prince Hotel but has worked from various hotels and restaurants both in Thailand and Hong Kong such as Imperial Hotel (Thailand), Tip Top Thai Restaurant (Thailand) and Supapra’s Thai Restaurant (Hong Kong). Some of items that guests can enjoy include Tom yam kung, Phad Thai, Thai chicken rice, Mango sticky rice and rich flavors of Thai grilled seafood items. The food festival will open on the evening of June 30 but will run on both lunch and dinner service thereafter. Diners can enjoy this authentic Thai buffet at Php1500 per person. Reservations can be made through phone at (82) 221 0888.